The following terms of service apply for all orders of consumers and companies in our online Store. Consumers are all natural persons who order products as private end users. Companies are all legal entities or corporations or natural persons that order products in exercise of their business, freelance or professional activity. These terms of service also apply to all future business relationships with companies without further notice. Orders are contracted between the consumer and Ghost GmbH. Product offers in our online Store are a binding offers to a closing of a sales contract. You can review and change your order during the checkout process. By accepting our terms of service and clicking on the order button you place a binding purchase order whit us. You will receive a order confirmation via E-Mail. 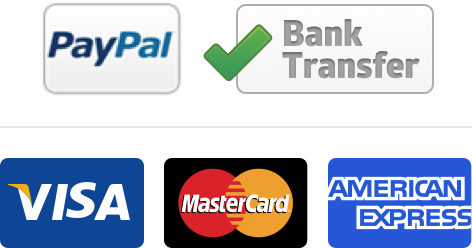 If you choose PayPal as your payment method your binding order will be placed by authorising PayPal payment. The wording of the contract is not saved by us. Orders may contain shipping or delivery cost. For more Information check the delivery options on our website. Orders will be dispatched as soon as possible. It is not possible to collect orders from our warehouse. We ship with UPS and DHL. After we received your payment we will ship your order quick and easy right to your door. You can make your payment simply by transferring the amount due to our bank account. PayPal is a convenient online payment service. You have to be registered to use PayPal. For further information on PayPal visit www.paypal.com. If you have a VAT Number you can place your order on invoice. After approval of your order by our credit department you will receive an Invoice via E-Mail or with your delivery. Please make your payment within 14 days after your order arrived. Private Endcustomers have the legal right of cancellation according to German law. Companies have no right of cancellation. All goods belong to our property right until fully paid.For Companies the following terms apply additionally: We claim property rights on all goods until every claim from an ongoing business relationship has been satisfied. You are authorised to resell our products, all claims from reselling our products will be assign to us, even if this sale is combined or mixed with other goods. Please help us to minimize damages in transit. Please immediately inform the forwarder if any parcel received has visible damages. Check if the packaging is intact. Inform the forwarder before singing your parcel about any damages. We guarantee great quality and service. All legal warranties apply.